Joshua Carroll Named 2017-2018 Maryland Teacher of the Year! 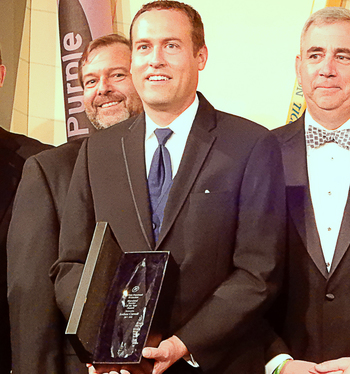 In October, MSDE held its 27th Annual Teacher of the Year Gala where Dr. Karen Salmon, State Superintendent of Schools, announced the 2017-2018 Maryland Teacher of the Year, Joshua Carroll! Joshua Carroll, a Science, Technology, Engineering and Math (STEM) teacher at Anne Arundel County’s South River High School, has taught in Anne Arundel County for 18 years and has spent his career teaching at the high school level. Joshua was selected from a group of seven finalists from across the state. The finalists were selected by a panel of judges from key Maryland education organizations representing principals, teachers, school boards, teacher unions, parents, and higher education. Finalists were measured against a rigorous set of national criteria that include teaching philosophy and results, community involvement, knowledge of general education issues, and suggestions for professional and instructional improvement. Carroll succeeds Athanasia (Sia) Kyriakakos, an Art teacher at Mergenthaler Vocational Technical Senior High School in Baltimore City, who was the 2016-2017 Maryland Teacher of the Year and a finalist for National Teacher of the Year. Catch a video clip of the long-awaited announcement by clicking the link below. Confirmed candidates to participate in the 2017-2018 Fee Incentive Program established for public school teachers seeking certification by the National Board for Professional Teaching Standards (NBPTS). Approved establishing 750 as the passing score for the current 6th grade cohort (2023-2024 graduating cohort) and all subsequent cohorts, and 725 as the passing score for current 7th graders and above. Approved the updated Emergency Planning Guidelines for Local School Systems and Schools. Granted permission to adopt amendments to regulations under COMAR 13A.04.16 Programs in Fine Arts to incorporate the new National Core Arts Standards that focus on the artistic process of creating, presenting, responding and connecting. Granted permission to publish amendments to regulations under COMAR 13A.07.08 Incentive Program for Certification by the National Board for Professional Teaching Standards. Amendments are necessary to update language to align with the current National Board for Professional Teaching Standards processes. The next meeting of the Maryland State Board of Education will be held on December 5, 2017 at the Nancy S. Grasmick State Education Building, 200 West Baltimore Street, 7th Floor Board Room, Baltimore, Maryland 21201. Appropriate accommodations for individuals with disabilities will be provided upon request. Eight business days notice prior to the event is required. Please contact Charlene Necessary at (410) 767-0467 or TTY at (410) 333-6442 so arrangements can be made. The State of Maryland put the spotlight on School Bus Safety through Governor Hogan's proclamation of School Bus Safety Week, held October 16-20. Greater attention is being paid to the stop arms on school buses, a new MDSE-sponsored survey has found. Stop arms swing out from a bus and lights flash whenever it is making an on-roadway student pick-up. A total of 3,384 violations of school bus stop arms were recorded on a single day last spring. As a result of these outcomes, school systems, bus drivers, and law enforcement have been charged with raising awareness about stop arm violations across the state. Click below to view a PSA on School Bus Safety from MSDE. 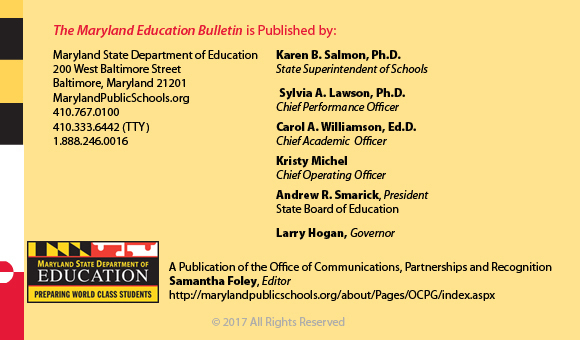 The second year of the State’s Broadening Options and Opportunities for Students Today (BOOST) Program provided scholarships this fall to more than 2,600 low-income Maryland students to attend nonpublic or faith-based schools during the 2017-18 school year. The BOOST legislation was created in the 2016 legislative session with the support of Senate President Mike Miller and House Speaker Michael Busch, and was signed into law by Governor Larry Hogan. BOOST provides scholarships for low-income students eligible for the free or reduced-price lunch program. For more information on the BOOST program, click below!